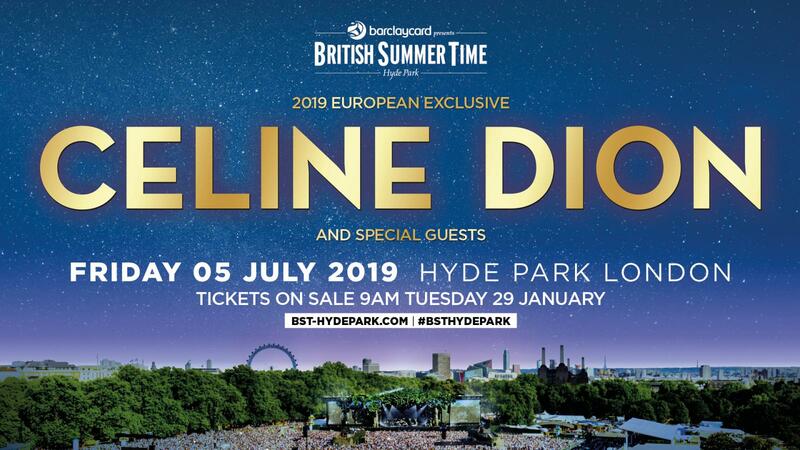 "It's my first time doing a show in beautiful Hyde Park.... I'm so excited. I love London, and it's a great honour for me to part of the BarclayCard presents BST Hyde Park concerts. I can't wait.... summertime in London, here we come!" An exclusive Team Celine ticket pre-sale for this performance will kick off on Wednesday, January 23rdat9 a.m.GMT, before the public on-sale date of Tuesday, January 29that 9 a.m. GMT. More info at www.celinedion.com/tour. Une prévente exclusive Team Céline pour ce spectacle débutera le mercredi 23 janvier dès 9 :00 am GMT, avant la mise en vente générale qui débutera mardi 29 janvier à 9 :00 am GMT. Plus d’informations au www.celinedion.com/tour.